The B-24 was especially designed for night missions, but this time she was out in daylight, along, poking in and out along the French Indo-China Coast hunting for stray Jap ships trying to sneak through our aerial blockade. The plane belonged to the 63rd Bomb Squadron of the Fifth Air Force's 43rd Bomb Group and her crew had sunk many a ship at night. This was their first daylight mission. At half-past ten in the morning they spotted an enemy convoy of four large merchant ships protected by three destroyers, two destroyer escorts and one light cruiser. This was a target for a large formation of bombers protected by fighter cover and flying high enough to keep out of reach of the warship's guns. But Lt. Williams and his crew were out to sink ships---and their bombs had been set for low-level attack. They lined up for a run and came in at 300 feet with every gun in the convoy shooting at them. They dropped three bombs on the biggest merchant vessel, but they were duds. 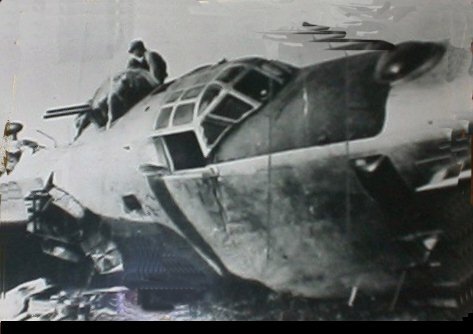 As the plane pulled away, the tail gunner was wounded in the leg and the tail section of the ship was riddled with bullets. Five minutes later they were coming in for a second run at the same altitude and this time they let go with their five remaining bombs. Two of them were hits; there was a violent explosion and as the crew looked back they saw the ship list sharply to port and belch black smoke. But Jap guns destroyed all the plane's trim tabs and elevator controls. And as it peeled away from the target two silver-colored Oscars came diving out of the sun in a frontal attack. They slammed a 20 mm. shell into the cockpit and killed the co-pilot. Then they wheeled and made another pass from the rear of the bomber. This time they killed the radio specialist, who had gone back to take the wounded tail-gunner's place. The navigator and the bombardier, who were manning the waist guns, were also slightly wounded on this pass. Now the Jap fighters came diving down again in a frontal attack and shot out the bomber's No. 3 engine. On their fourth attack from the front they made hits on the No. 1 and 2 engines and destroyed the top turret guns. But one of the Oscars was hit and was trailing smoke when last seen. The remaining one made several more passes but the bomber escaped into a cloud cover and headed for home. The hydraulic system was destroyed, the radio was shot out, a severed fuel line was gushing gasoline into the bomb bay, the No. 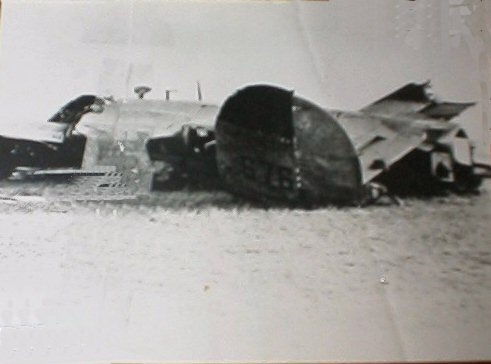 3 engine was gone, another was damaged, the compass and other instruments were shattered, the controls were cut, two men were dead and two more injured. The wounded were given first aid, all loose equipment was jettisoned to lighten the plane, the gas leak was repaired, the co-pilot's body was removed to the bomb bay and the crew members alternated in his seat to help the pilot. The plane had no altitude and their first problem was to get her up. Straining with all their might, they managed gradually to nudge her higher. But the weight was too much for them; they took the interphone wires and tied the controls back and in that way slowly gained height. Gasoline was low and they had only two good engines and they might or might not make their base, but they decided to fly her out. For six hours she limped along, and the crew didn't know if they could land her when they did get there. They made the field and they had to crank the landing gear down manually. The nose wheel stuck, and they had to kick and cut and pry it loose. They couldn't contact the tower because the radio was gone. They dropped signal flares but they didn't go off. With the wheels down the plane lost altitude rapidly. They had no choice; they circled once and came in to land. The plane came down heavily, and at the moment of contact the navigator, acting as co-pilot, hit the crash bar. She was on the ground and for a moment it seemed that they had made it. Then the right wheel collapsed, the big plane slewed violently around, skidded and crunched into a crumpled heap. She was a complete washout. But miraculously she didn't burn and, more miraculously, all but the men who had been killed in the air came out of her under their own power. All of them were badly shaken up, and five of them were bruised and battered enough to require hospitalization, but none were seriously injured and they'll all be back to sink more Jap ships. Marc Rifkin, who sent these great pictures, wrote: "As a young child, my mother often told me the story of my father's last mission. It was, in fact, the Williams mission. He was the top turret gunner, S/Sgt.Morris (Morry) Rifkin. He never spoke of his war experiences to anyone but my mother. He was the gunner wounded in the leg, who sat in the co-pilot's seat and broke his shoulder in the crash. He was in the hospital when he found out I had been born (on March 15, 1945). The mission occurred on March 28, 1945. ...One of the crewmen lived for only a day or so and died in the hospital, in the bed next to my father's. The only member of the crew to suffer no injuries was supposedly Lt. Williams, who was said to be 18 years old at the time. My father was the "old man" of the crew (he was 25 years old).